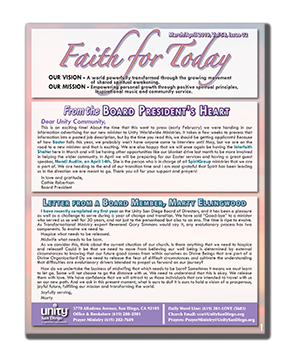 The New March/April 2019 Faith for Today is now here for you to download, and the printed version is available in the Tower Lobby by the bulletin board. And click here if you would like to receive the Faith for Today newsletter in your email when the new copy comes out every two months. To be notified of when the next Faith for Today newsletter is available, please sign up below. We respect your privacy! Your email address is never shared, sold or otherwise distributed. You may unsubscribe at ANYTIME.